Living in the modern world, we are often faced with lifestyle choices that define who we are and who we will become. For years these differences have torn people apart, as there seems to be no definitive guide to which path is the right path. The unfortunate outcome of this is, inevitably, violence. Through oppression, discrimination and persecution, each side tries relentlessly to convince the other that they are in the right. Since this is the case, then HuffPost Arts hereby introduces ETSY DEATHMATCH, a battle royale of sorts, in which age old conflicts will duke it out via the twee DIY website Etsy. We will compile a slideshow representing the battling sides and leave it to you to decide once and for all which side makes you say "aww" the most. Etsy is no longer only your place to buy and sell. It is your place to dominate. May the cutest thing win. 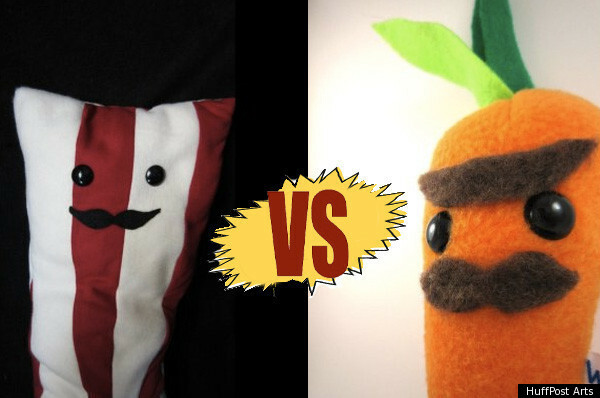 For the first installment of ETSY DEATHMATCH we bring you: Carnivores v. Vegetarians. Meat is very delicious, and we know that bacon seems to be a favorite amongst meat enthusiasts. Meat also has the status quo advantage, since it has been the established way of life for some time. Vegetarianism, however, has the moral argument on its side and is more of a personality-defining choice. There are increasingly more options everyday for veggie-lovers and word on the street is they actually feel better than you do. But enough with the talking, let's see some kitsch!